Review Context: I’ve never played a game by Defiant Development. While I’ve played many rogue-likes, this game is unlike any other I know. 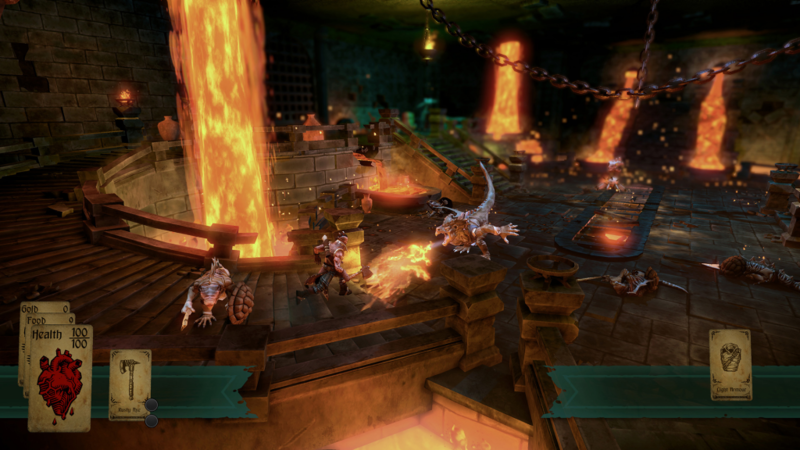 Hand of Fate is a hybrid between a deck building rogue-like and a third-person hack and slash. In order to reach the end of a floor the player must travel across a grid of cards, each step bringing its own set of challenges. From deciding whether or not to give your precious food to the sad peasant mother, or determining if opening the chest with the scary demon face on it is a good idea, these encounters often involve chance cards where the player is shown four cards that are then shuffled. The chance of success is determined by the encounter ranging from 1 in 4 chance to trip and scuff your knee to a 75 percent chance your blood is sucked from your body by a horrible demon. Once your fate has been decided, if the outcome is a fight, you are transported to another world where your character stands before you with all the spoils and gear you’ve collected. You must then face your fate, and if you can overcome the challenges set before you, you will not only be granted rewards for the journey at hand, but also new cards to increase your deck and the possibilities. 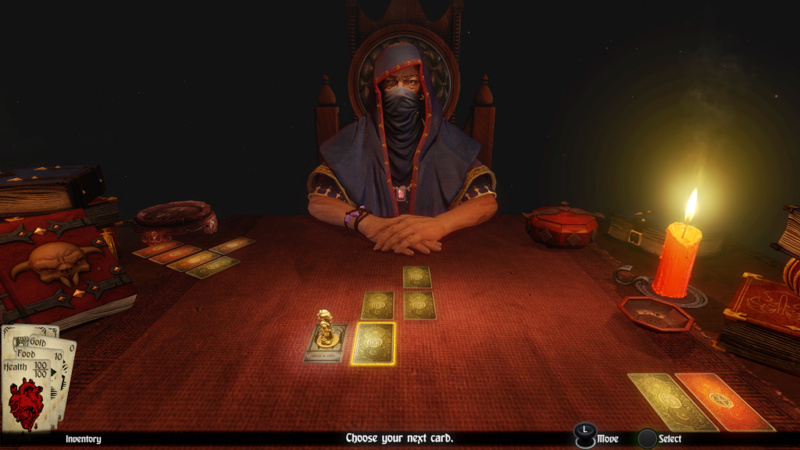 Hand of Fate has an interesting mix of calming atmosphere and stressful encounters. In a game that is half sitting in front of an old man reading text, you need to be able to keep the player interested. The dealer and his dialog do a lot to make the player feel like they are playing a game with someone. In an age of repeating dialog and predictable reactions, the dealer is well versed and very well spoken. The music is also soothing yet mysterious, which befits the nature of the game. Then you stumble upon an ambush and suddenly you are fighting for your dear life against skeletons and rat men. As your health drains so does your composure, the perils of the journey start becoming all to real. Then you take another step and an angry mob mauls you and steals all the food you had. Now with only enough health for a couple steps, since moving a tile without any food takes health instead, you are left praying for something to save you. For being a rather simple game it is really quite engaging. The hack and slash fighting is very polished as well. There is a combo system that increases your damage the longer you go without getting hit or missing an attack. Certain attacks can be countered with a well timed button press. If you have a shield, you can even knock back most incoming projectiles. With different enemies, abilities, hazards, and equipment its never just bashing on the same monsters in the same circle. The variety keeps everything interesting, while the fluctuating difficulty keeps it challenging. A fight can be as simple as 2 rat men, or as daunting as 4 bandits, 3 skeletons, 1 Queen of Bones, and 2 lizard men all swarming over you. A fight can be easy if you’re full health with a shield and a nice ability, or a nightmare if a bandit just made off with all your gear. Nothing is more terrifying than stumbling into a battle you know you’re not prepared for. The story mode consists of finite dungeons with a boss at the end. Defeating these bosses and overcoming challenges along the way unlocks more cards to add to the deck. After story mode is over you can play infinite mode, where after every floor the dealer adds more dangers and monsters. The more cards you have the longer your story can be, provided you survive that long. 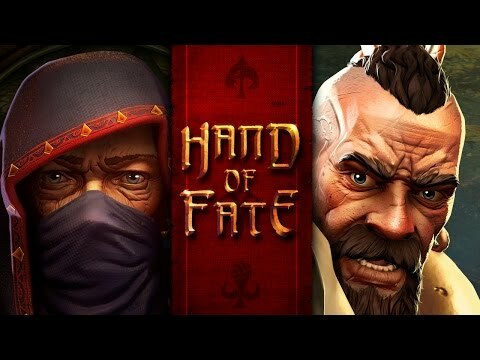 All in all, Hand of Fate is a wonderful addition to the rogue-like genre. If there was one negative I had to apply to this game, its that once you’ve read a card and experienced all of it’s outcomes the text becomes irrelevant. While this happens to most rogue-likes as well, it is a little more impactful for Hand of Fate since a lot of it’s charm comes from the writing. However, this could be easily fixed by a booster pack DLC, which the game is perfectly suited for. The more cards in the deck, the grander the story. What will your fate be?